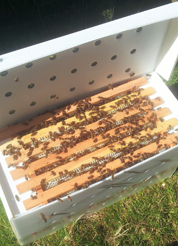 As well as selling our raw honey we raise our own nucleus of bees and we sell top quality mated queens. We also sell a wide range of top quality bee keeping equipment from cedar hives, wax foundation & frames to varroa treatments and bee feed. Here at Becky Bees we welcome enquiries from you regarding suitability, hive positioning, equipment & accessory choices, swarm prevention, disease & parasite control & eradication, feeders & food for the bees, methods & techniques for splitting, uniting, re-queening, winter preparation etc etc. We have many years’ experience in beekeeping and we cater for beginners as well as experienced bee keepers, we aim to offer a high quality service with practical information to both new and seasoned beekeepers alike. We can offer advice on all aspects of bee keeping to our customers, not just at the point of purchase, but also in an ongoing manner to help keep your bees healthy and producing top quality honey and also to keep you, the bee keeper safe. Although the idea of keeping bees can seem to be daunting, with some research, help and practical experience, you will soon be on your way to enjoying the fascinating art of bee keeping. It seems that the more you learn about bees, the more you want to know, and some of the best bee keepers in the country are still learning from the bees, even after having kept bees for many many years. Most areas of the UK have a local bee keepers association, where you can meet likeminded people and enjoy a friendly, sociable evening talking and learning about bees. These associations can be a valuable source of information on many aspects of bee keeping. Please browse through and enjoy our website, if you have any enquiries or questions you can email Becky at beckysbeezzzs@gmail.com or alternatively you can find telephone numbers on our Contact Becky page.